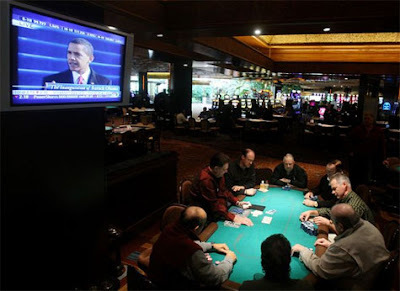 President Barack Obama's inauguration speech is displayed in the poker room at the Mirage hotel and casino in Las Vegas. I wondered what kind of picture you would choose to mark the day. I kind of like that this one makes me feel less certain and full of hope than what I've been seeing.